With a structural height of 202m Heron Tower, which recently topped out, is already dominating the City of London’s skyline. Martin Cooper reports from the 46th floor. Over the years the City of London’s skyline has continually evolved as higher and more prominent buildings take shape in the nation’s capital. The latest structure in this continuing process in the Square Mile is Heron Tower, currently under construction close to Liverpool Street Station. When complete the 46-storey steel and glass tower will be 202m tall, with a mast adding a further 28m to its overall height, making it the highest building in the City. 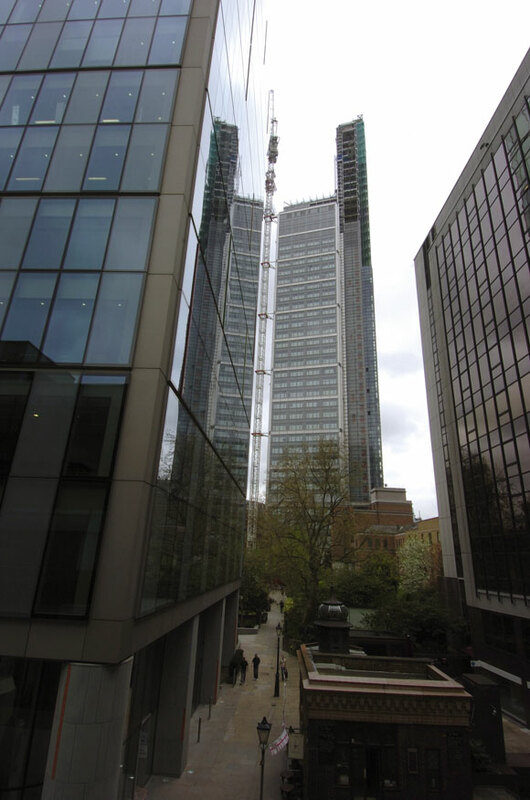 A significant milestone was reached on 12 April this year when Heron and Skanska held a topping out ceremony to mark the structural completion of the tower. The project is on schedule to be completed in February 2011. Designing and constructing a new high profile tower such as this always brings with it a host of unique challenges. In the City of London, the complex layout of ancient streets and lanes often impacts on a project, and has made deliveries to the Heron Tower site challenging at times. However it is sustainability and prestige which have driven this project. The fact that the structure will create over 3,000 workspaces within walking distance of ten underground stations means the project is a model sustainable development. Companies based in the City of London are also looking for modern flexible workspace, ideally located in a prestigious setting. The architectural vision for Heron Tower has taken this into account by creating a building which is based around a series of three-storey office villages, at the heart of which is a triple height atrium. These three-storey office villages begin above the building’s three-storey high ground floor retail arcade and entrance lobby, and then extend up to the 36th floor. Below the arcade there are three basement levels, adding to the structure’s three floor symmetry. More offices are located on level 37 and a public restaurant and skybar will occupy floors 38-40. Above this, the tower’s topmost floors accommodate plant areas. Kohn Pedersen Fox the project’s architect says, in contrast to a typical monolithic appearance with a centre core, the Heron Tower has an offset core along its southern elevation which creates a structure with clear and open floor plates. By positioning the service core along the entire south face of the tower it also shields the offices from unwanted solar gain. In contrast, the village atria are lit by triple height windows along the Bishopsgate elevation allowing north light to penetrate the workspaces. Each atria features diagonal steel bracing – encased in concrete – along this elevation. Building such a tall landmark structure in the centre of one of the world’s busiest financial districts obviously requires plenty of planning. In order to minimise deliveries of steelwork (12,000t of structural steelwork has been used) to a site surrounded by busy roads and lacking a large delivery area, pre-fabrication has come to the fore (see box above). However, before any of the prefabricated steelwork was erected the groundwork and foundations had to begin. Two buildings had to be demolished to clear the site and then a top-down construction method was employed which allowed the three basement levels to be piled and excavated while the steelwork was erected – at the same time – for the three-story high ground floor arcade. Above the arcade the tower’s village office scheme area was then erected along with the adjacent off-set core. The perimeter of the office area, which consists of three elevations and the dividing line between the offices and core along the south side, is formed by a series of single storey high fabricated sections. Brought to site in erectable pieces and fabricated from plated sections, they form a stability or moment frame around the office plate. Much of the tower’s stability is consequently derived from this frame, as opposed to the core which is braced but gets its stability from the frame. Erecting the stability frame required two-storey high temporary braced steelwork to be installed. 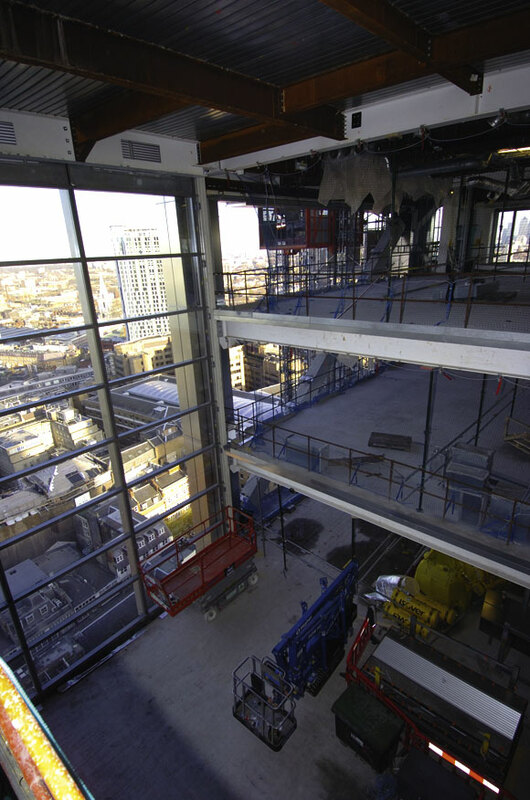 When two floors of steelwork were complete (including the office’s long span Fabsec beams which allow for the clear column free office space) and the concrete floors cast, the temporary works were removed. The temporary steelwork was then lifted up to the next level as permanent stability had been reached once the concrete floors below had cured. A total of 12 lifts will be housed within the off-set core, five of which will only extend up to the 23rd floor. Five others will carry on up to the 41st floor, while another two will whisk guests non-stop up to a 40th floor restaurant. 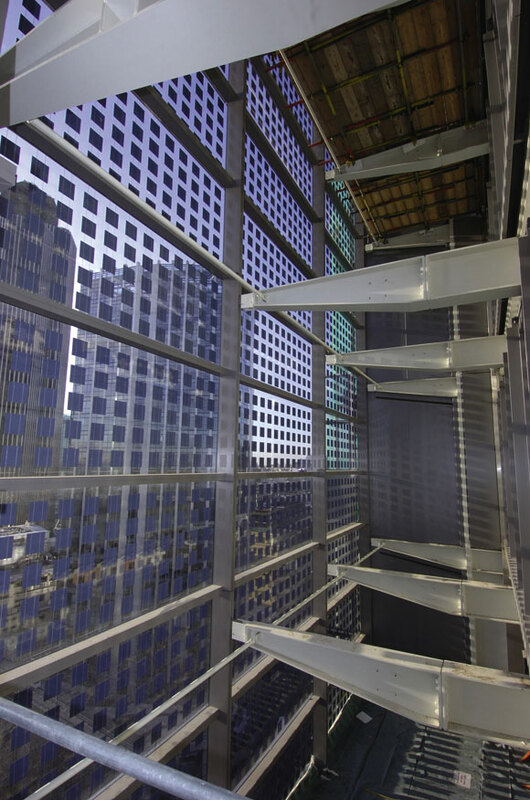 All in all, the construction of Heron Tower has utilised a number of innovative steelwork solutions to create a new London landmark. 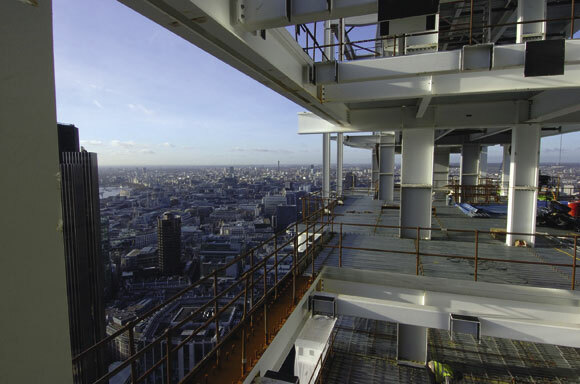 Much of Heron Tower’s structural frame has been prefabricated by Severfield-Reeve at its Yorkshire facility and brought to site in erectable sections. The stability frame sections, weighing 18t each, have been delivered to site on bespoke trailers, fitted out specially to carry this unique steelwork. The single storey frame sections comprise of two columns and one 12m-long beam along the top, all fully welded, which form the perimeter for one and half structural bays. The sections arrive at site and can be lifted straight off the trailers by tower crane and erected immediately. “There is no site welding necessary and we’ve reduced the amount of bolted connections, which means a faster erection process,” explains Richard Tarren, Severfield Contracts Manager. The tower’s steel framed off-set core has also been erected with prefabricated sections. 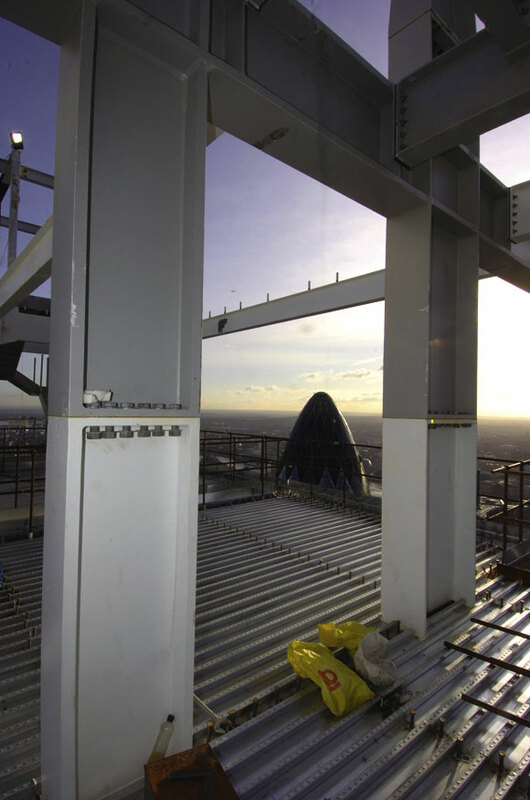 The core has been formed with a number of fully welded T-shaped sections, each one floor high and weighing 16t. Again, with less on-site bolting and less steel members the core’s erection has easily kept pace with the rest of the structure. 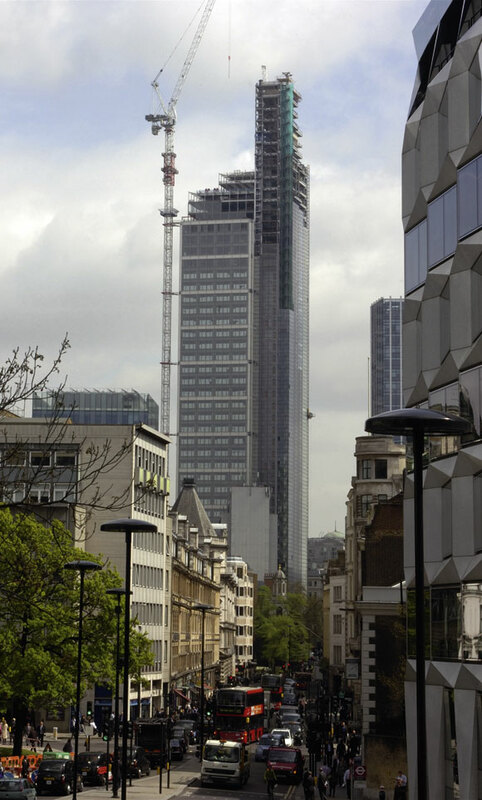 A BREEAM ‘Excellent’ rating has been awarded to Heron Tower. The building will have photovoltaic cells to generate renewable energy that contributes to the overall power requirements of the building and help to create a solar shield and triple skin glazed façades to reduce heat gain by 45% over a standard glazing solution. Commenting on the award, Steven Evans, Development Director for Heron Tower, said:“Heron Tower’s beauty is not just skin deep. Our focus has been on developing a building which will be one of the most advanced buildings in the world, setting a global benchmark for quality in commercial office space.